Brian Glanville reacts to the report into the scandal-hit bidding process for the 2018 and 2022 World Cups. 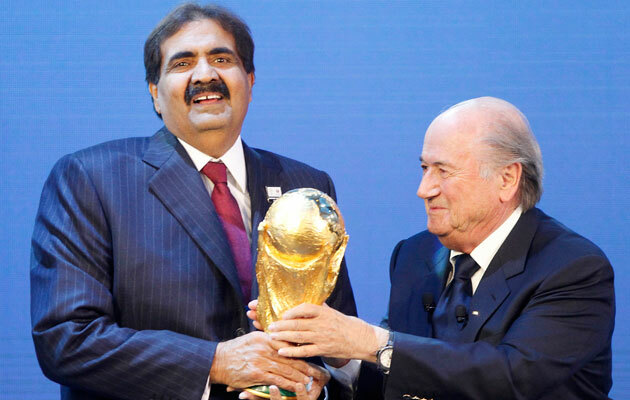 Sheikh Hamad bin Khalifa Al-Thani, Emir of Qatar, left, gets the World Cup from Sepp Blatter. Don’t say FIFA: say fiasco. As alas might have been expected, the long delayed Michael Garcia report is less a damp squib than a missive irrelevance. Above all because Blatter saw to it that it was completed in such haste, before the start of the World Cup, that it was inevitably unable to take account of the shocking revelations in the Sunday Times, result of examining emails, over a malfeasance of Bin Hammam and the large sums he spent on bribing voters in Qatar’s favour. That England should have been wrapped over the knuckles for its pathetic ingenuousness for trying to suborn that repugnant crook Jack Warner, humiliating Prince William and David Cameron in the process, remains a deep embarrassment, and a deserved one. Predictably, that rogue when push came to shove didn’t even cast his Caribbean vote for England. So much for Andy Anson’s inept committee and its expensive attempts to suborn him. But that was nothing compared to the way Qatar so palpably secured the tournament, against all logic. No least the 50 degrees heat which would have made participation by fans as well as players such a hazard. This in turn propitiating the fatuous alternative on playing the tournament in the European winter. Thus utterly disrupting European club football then. And Russia? Also accused of buying a tournament which should never have been given them, with the appalling racism endemic in their football. They just happened to have “lost” the potential damning emails. And will thus presumably slid out of their potential troubles. As for Qatar the latest amnesty report confirms that literally hundreds of the poor devils, mainly from Nepal, have died on construction work, being horribly exploited and reduced to a kind of slavery through the confiscation of their passports. Now it is reported that North Korean workers are being exploited too, the bulk of their meagre wages going to the savage regime of their irrepressive country. What next? Ideally a European revolt. Led by Platini? You’re joking. Very recently, he has said that if corruption by Qatar be proved, then withdrawing the World Cup from them would be on the cards. Well, they haven’t been indicted. Not by Garcia, anyway.